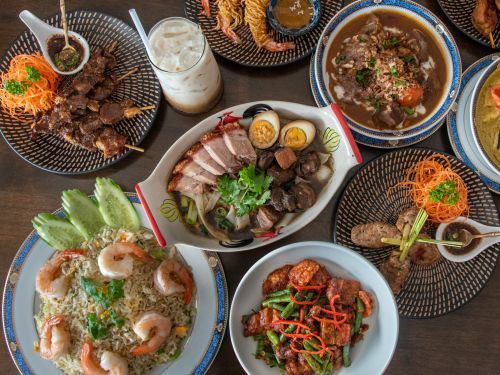 Thai Thai Restaurant - Casuarina uses their own specialised couriers to deliver their food. Crispy rolled filled with vegetables and vermicelli served with plum sauce. Pastry shells filled with carrots, peas in curry spice. Minced pork, coconut, peas and coconut wrapped in a golden bag. Patties made of a blend of fish, red curry paste and spices. Fried chicken wings coated in a spicy sauce. Fried chicken wings coated in a garlic sauce. Pork, prawns, fresh herbs rolled with rice paper, herb sauce. Spring roll, curry puff, fish cake and chicken wing. Marinated in herbs with peanut sauce. BBQ pork marinated in herbs. Prawns wrapped in crispy egg noodles with sauce. Grilled herb infused pork blend, served with a delicious vibrant sauce. Wok tossed crispy pork belly, green beans, bamboo, holy basil, chilli and garlic. Wok-tossed crispy pork belly with green beans, dried shrimp, chilli and kaffir lime leaves. Wok tossed kang kung vegetables with crispy pork belly, chilli and soy sauce. Strong aromatic stir fry with krachai, red curry paste, Thai eggplant, young peppercorns, kaffir lime leaves and coconut milk. Stir fry kung kung with soy sauce and garlic. Finely sliced grilled beef steak served with a special spicy sauce. Garlic and ginger infused chicken. Crispy pork belly topped with soya bean sauce. Crispy squid stir fried with salt and pepper seasoning. Braised pork belly in a five spice broth with boiled egg and pickled cabbage. Crispy fish fillet topped with sweet and tangy tamarind sauce. Crispy fish fillet topped with garlic and chilli sauce. Red curry paste, kaffir lime leaves, coconut milk in a thick curry. Marinated and roasted in spices. Medium hot green chilli curry, Thai eggplant, basil, coconut milk. Mild medium red curry, Thai egg plant, coconut milk. Turmeric, carrots, potatoes, onion, coconut milk. Peanuts, kaffir lime leaves, coconut milk. Mild chunky beef, peanuts, potatoes, onion. Reccomended with any BBQ grilled dish. Red curry paste, kaffir lime leaves, onion. Rice noodles, egg, bean sprouts, peanuts, tamarind sauce. Flat rice noodles, egg, garlic and soy sauce. Flat rice noodle, garlic, chilli and basil. Flat noodles topped with a thick oyster sauce. Topped with a thick oyster sauce. Thin rice noodles, curry spice. Green papaya, carrots, green beans, tomato, shrimp, lime, chilli. Green papaya, carrots, fermented fish sauce, shrimp paste, tomatoes, chilli. Chicken, mint, cabbage peanuts with nouc cham dressing. Grilled sliced beef, lemon grass, mint, cucumber, chilli jam. Minced chicken, ground rice, mint, lime juice. Vermicelli noodles, mint, bean sprout, nouc cham dressing. Grilled sliced beef, ground rice, mint, lime juice. Glass noodle, tomato, onion, lime juice, seafood. Chilli jam, cucumber, mint, tomato. Mild soup with galangal, lemon juice, mushroom, herbs and coconut milk. Spicy and sour soup, lemon grass, lemon juice, chilli paste and mushroom. Seafood soup with herbs, lemon juice and mushrooms. Rice noodles, broth, slow cooked beef, beef balls. Minced pork, bean sprouts, peanuts (soup/ dry). Rice noodle soup with chicken. Egg noodles with BBQ pork. Egg noodles, chicken drumstick in a Northern region coconut curry. Flat rice noodle soup with pork belly, boiled egg in a five spice broth. Glass noodles with Chinese cabbage, celery, water spinach (soup/ dry). Flat noodles, seafood, vegetables with red bean curd (soup/ dry). Egg noodles with roast duck. Egg noodles with crispy pork belly. Ginger, mushrooms, baby corn, onion. Red curry paste, young peppercorn, green beans, coconut milk. Strong aromatic stir fry with red curry paste and herbs. Green beans, dried shrimp, chilli and kaffir lime leaves.